MEP Karl-Heinz Florenz hosted the ceremony at the European Parliament in Brussels and in the presence of EU Director General for Environment Daniel Calleja Crespo, this year’s prize was awarded to a Spanish project focusing on holistic land management practices and an innovative sowing machine for field margins. 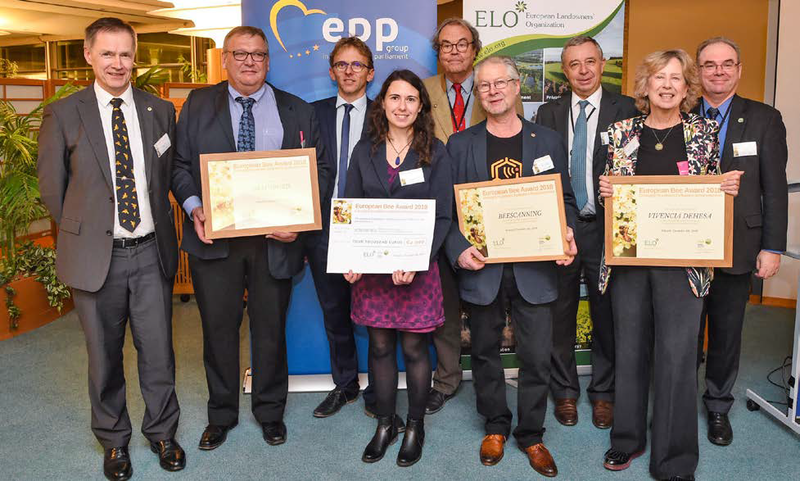 The European Bee Award was established by the European Landowners’ Organization (ELO) and the European Agricultural Machinery Industry Association (CEMA) in 2014, to acknowledge innovative & practical ideas to protect pollinators in European farming. "Vivencia Dehesa" a project whose main objective is to actively manage a private protected natural area in a sustainable way in order to improve biodiversity, is the winner of the “land management practices” award. Nora von Liechtenstein presented the project. 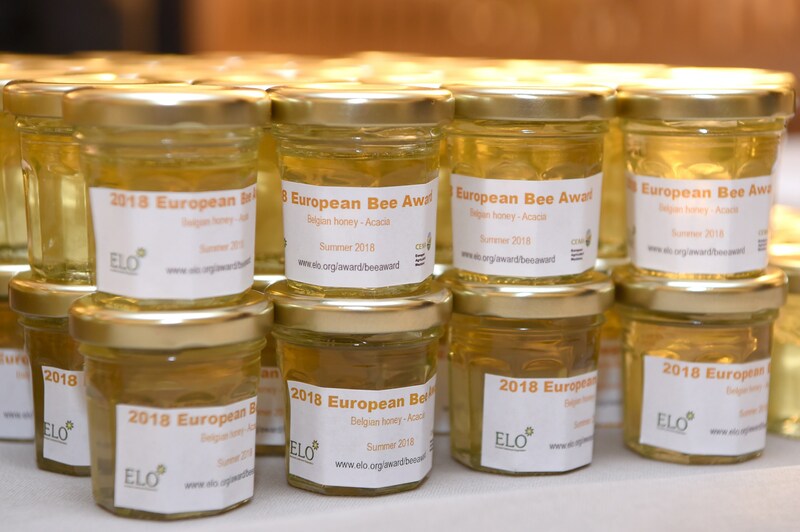 In 2018, the European Bee Award competition received 17 applications from various European countries. The award ceremony gathered over 100 participants in the European parliament: bee-keepers, policy makers, landowners, academia and representatives of the agri-food sector exchanged best practices, while enjoying a festive networking evening celebrating bees and biodiversity. In a ceremony hosted by MEP Franc Bogovič at the European Parliament in Brussels and in presence of EU Commissioner for Digital Economy and Society Mariya Gabriel, this year’s award celebrates in particular the great commitment of private and public organisations, as well as individual initiatives, to pollinators’ wellbeing and bee-friendly farming practices in Europe. "A bee project for solitary bees" by the Belgian material solution company Sibelco, as part as its Biodiversity and European Species protection programme, is the winner of the “Land Management Practices Award". "Dropleg: Application of Plant Protection Products below the flowering level in rapeseed" presented by the specialised nozzles company Lechler GmbH receives the “innovative & technological solutions” prize. Moreover, a "Friend of pollinators" award has been bestowed to Mr. Marek Nowakowski for his contribution to the protection of pollinators as a private individual, and a special mention was granted to “Terras de Mondalva” for an integrated beekeeping project for rural development in Portugal. Franc Bogovič MEP, Member of the Jury, stressed “the European Bee Award adds the necessary recognition to very valuable projects which year-on-year show there is a shared commitment to protecting pollinators in European agriculture”. Mariya Gabriel, European Commissioner for Digital Economy and Society congratulated the initiative “Events such as the European Bee Award are very important for the promotion of the protection of bee health. It is crucial that we maintain bee-health and the interests of the beekeeping sector on the top of the political agenda, at all levels, as well as to promote initiatives and projects, which allow awareness-raising for policy-makers and citizens, and to be proactive in addressing the challenges of the beekeeping sector”. Marleen Evenepoel, CEO of the Agency for Nature & Forests Government of Flanders, emphasized the actions undertaken in Belgium for the protection of pollinators, such as the ‘Week van de bij’ in Flanders, or the signature of the Declaration of the international Coalition of the Willing on Pollinators. Learn more about the actions clicking here. On behalf of CEMA, Gilles Dryancour, Honorary President, welcomed the contribution of the farm equipment industry to develop cutting-edge spraying technology that improves in parallel farming activities and the protectionof pollinators’ populations, as showcased by the Dropleg project. In 2017, the European Bee Award competition received 18 applications from 11 different European countries. The award ceremony brought together over 100 participants: bee-keepers, policy makers, landowners, academia and representatives of the agri-food sector, exchanging best practices and enjoying a festive networking evening celebrating bees and biodiversity.